Lily and Dan set a date to do their engagement session, and as the date got closer, the weather started to look more and more cloudy on the weather app.. >_> We decided we would chance it and wait until the last possible minute to make the final call. Lily couldn't reschedule because she was getting her makeup trial done that day so we could do the shoot right after. Finally when the day came- the weather app "said" that it wasn't going to rain during our time frame for the shoot so we were ecstatic! 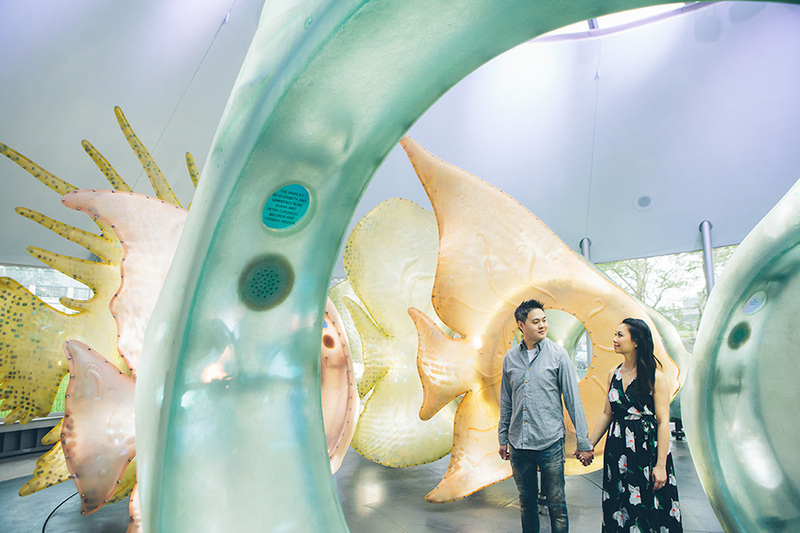 We met at our proposed place, the Sea Glass Carousel in Lower Manhattan, New York City. When I got there... it was POURING ;__; Luckily it was an indoor carousel.. and even luckier was that it was empty since no one else was nearby crazy enough to come during such a huge storm. I had a such a fun time photographing in the empty carousel and getting great shots of Lily and Dan!!! After we felt that we had spent enough time there, the rain actually stopped and we were able to finish up the shoot outdoors and walk over to Battery Park!!! It couldn't have worked out any more perfect! You really never know what to expect when youre trying to shoot weddings or engagements here in New York City!